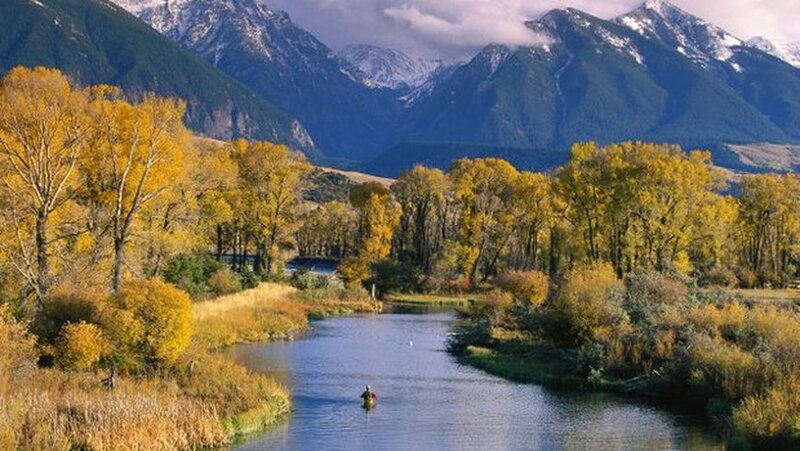 Montana's mountains and fall foliage create a dramatic backdrop for a lone fisherman in a creek in Paradise Valley, north of Yellowstone Park. Fall in Montana is the secret season. The first-time tourists -- those who came, naturally, to see America's great national parks Yellowstone and Glacier -- have at crack of Labor Day gone home to school and jobs. Now the light is filtered and the air crisp. Elk are bugling. Leaves are turning. Fishing's good. Very good. Temperatures are not so hot in the day, not yet cold at night. It's possible to get out and alone, canoeing, mountain-biking, hiking or horseback riding -- soul repair from possible urban damage. These days, Montana is a fascinating mix of the Old "ride-'em-high-TV-cowboy" West and "de novo" West, with a biotech cluster, laser optical startups, fracking plays and killer software companies such as Right Now Technologies that sold to Oracle last summer for $1.5 billion, which, in Montana, buys a lot of horse manure. I like to sneak in my annual pilgrimage to southwest Montana sometime before Halloween, certainly, when it is generally snowing ice and bullets. Most of the year, I'm condemned to live in the little seaside favella of La Jolla, drink expensive wine and eschew Bourbon and beer, think high-tech thoughts and not worry about what the trout are doing. But in Montana, I'm allowed to get rangy. My grandfather Dr. Henry started the hospital system in Billings, Montana's little Denver, and was mayor back in '82. That's 1882, when Liver Eating Johnson (Redford movie: "Jeremiah Johnson") was deputy sheriff and the real Calamity Jane was attending to tubercular miners in her crib on the Rimrocks, a late Cretaceous formation that overlooks the town. But to begin my road trip -- and all trips to Montana are road trips since the place is really 10 small towns laid out on a mountain prairie grid almost the size of California connected by some snaky blacktop -- I like to fly into Bozeman. The bowl of mountains -- Bridgers, Hyalites, Spanish Peaks -- hits the system with a shock of beauty upon touchdown. And then if it's still early, I like to scare the geese off East Gallatin Pond with a swim, after which a breakfast at the Western Café (hearty beyond all tradition); saddle up the rent-a-car and begin my Holy Loop. That rambling loop of maybe three days takes me from Bozeman, down the Gallatin Canyon to Big Sky to bivouac at the Lone Mountain Ranch, up at dawn again to float-fish the Madison River at Lyons, back to the lodge for dinner, choice of Pheasant "Pot Pie" or Wild Boar Tenderloin (entrees difficult to find at Piatti on Avenida de la Playa); a righteous ramble across the top of Yellowstone Park, stopping not to pet the elk along the Firehole but definitely to ask sage advice at Park's Fly shop in Gardiner; thence down East River Road in Paradise Valley (careful not to bump your head on the clouds) to Chico for an exquisite soak in the hot pool (learned to kayak in that pool long ago); more non-plant-based food -- antelope medallions this evening -- with Chico's former chef now night manager, Matt Jackson; then a not-so-early mosey down valley to the Murray Hotel in metropolitan Livingston, a town that is beginning to remind me of a grunge Aspen circa 1963. They supply you with earplugs at the Murray to block out the sound of the Burlington Northern across the street and also the band downstairs. My room was under the Peckinpah Suite, where old Peck, the fun-violent director of "The Wild Bunch," once tried, they say, to shoot the tails off his cats with (let's hope) little success; and thence on down Interstate 90 to Billings, which follows the Yellowstone, last longest free-flowing piece of water in the Lower 48. Montana was the final state to inflict a speed limit on its scattered residents (1 million people, 147,164 square miles,) and no True Montanan really honors this calumny much today. Your 120-mile drive should take you no more than 90 minutes. I spent the night at the brand-spanking remodeled Northern Hotel in Billings, chatting with owner Chris Nelson, fourth-generation (or so) local, who put his Montana public education to work by creating Zoot, a software filter that checks your credit at most stores in California. It must be a killer app for Nelson to have held off the Silicon Valley girls for 20 years and, again, a good app buys a lot of hotels, in Montana. My mother's friend Billy Tippet once rode his horse into the lobby of the Northern for a drink. That was before the remodel. Long time before. But we stray into business writing. And Montana is famous as a land of literary writers. In fact, you can make the same loop into a read-along literary journey if you wish. 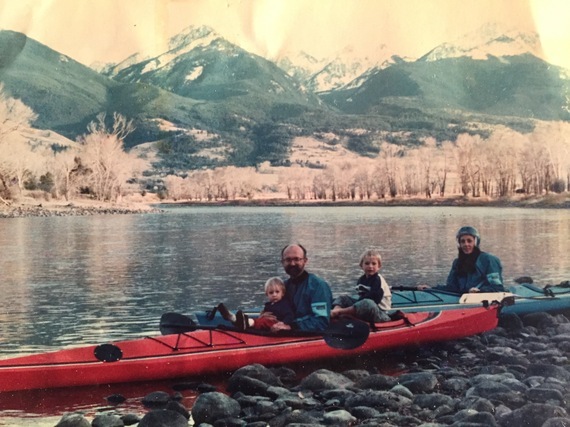 For instance, I talked about the polar bears in the Russian Arctic with Nat Geo contributing writer David Quammen at his turreted house in the historic district of Bozeman; brought a mercy six-pack of Heineken to friend Doug Peacock ("Grizzly Years," best book on bears, or Vietnam, for that matter, ever written) at his home on the old Malcolm Forbes' ranch. Peacock was shirtless with an impressive knotty scar running almost from nave to chops from open-heart surgery. He told us Peter Matthiessen was flying in the next day to get some final fly-fishing done before he, like all of us, checked out of the hotel. McGuane emailed that he was in Canada, fishing, I suppose. Gatz Hjortsberg was in L.A. or something (and I shamelessly recommend pages 679-680 of his epic biography on Montanan Richard Brautigan, "Jubilee Hitchhiker.") But we did chat up J.D. Souther outside the Murray. Souther wrote "Heartache Tonight," "New Kid in Town," and a good number of the best Eagles hits (along with Linda Ronstadt's). Nope, did not run into Jeff Bridges, Dennis Quaid, John Mayer, or, god forbid, Katy Perry. And, anyway, outside-of-Montana name-dropping, you don't want to. Steve Chapple is the author of "Kayaking the Full Moon: A Journey Down the Yellowstone River to the Soul of Montana." He also writes Intellectual Capital, about game-changing ideas and people.